Yes, it is perfectly acceptable to extend in front of and/or at the end of a word in one turn, as long as all the letters are played in the same turn. So, in this case, since the C, H, E and D are all used to spell CHARMED, it's well within the rules to do so. Learn the two-letter words, three-letter words and also the other world lists. 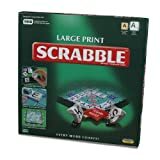 There are two commonly accepted methods for controlling the time of a Scrabble game. First, a three-minute hourglass may be used to time each play. After 54 minutes the game is over and both players now have one more play before totaling the final scores. Second, chess clocks are set up so that each person is given 25 minutes to complete all his/her turns. That way, a player may play quickly for easy plays and save up time in order to take five or more minutes for the difficult plays. If a player uses more than 25 minutes, then s/he is penalized 10 pt. every minute or fraction of a minute used more than the original 25. There is no discussion in the boxed rules about what to do in this situation. The opponent randomly draws three tiles from the offending player's rack, looks at them all, and then chooses which two to return to the pool of letters. The remaining tile goes back to the player's rack. If a player overdraws two tiles, then the opponent randomly draws four tiles from the player's rack, chooses which two to replace in the pool, and returns the other tiles to the player. And so on. In each case, the offending player may see all the tiles seen by the opponent. This overdrawing penalty influences most players to draw their tiles more carefully. One further note about overdrawing: If the overdrawing player realizes s/he has overdrawn before mixing any of the new tiles with the old ones, then the opponent should randomly choose tiles only from the group of newly drawn tiles, while following the instructions given above. The official rules do not allow a player, later in the game, to change the letter that the blank represents. Likewise, a player may not replace the blank with the letter it represents and use the blank in another word. At the NSA's clubs and tournaments, this rule is strictly enforced. The NSA also advises that to avoid later confusion, both players record on his or her score sheet what letter the blank represents at the time it's played. Those of you who'd like a game with more scoring chances may play the variation that allows players to replace a blank on the board with the letter (from your rack) it represents. The drawback (or advantage) to this game is the increased luck factor. A player may exchange tiles (from one to seven) as long as there are at least seven tiles still in the bag. Decide which tiles you want to exchange first. Then remove them from your rack and place them facedown on the table. Only then may you draw your new tiles, place them on your rack, and replace the exchanged tiles back into the pool. 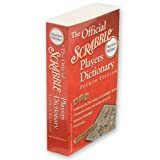 Yes, Merriam-Webster's Official Scrabble Players Dictionary. When can I challenge? And how many words can I challenge at one time? Using sand timers or no timers: Once a player has announced his or her score, the opponent may "Hold!" or challenge. After the player has drawn at least one tile from the pool, the opponent may not challenge or hold anymore. To avoid what we call "speedy-draw syndrome", the player must take a few seconds to record the total score before drawing replacement tiles. Using tournament clocks: After the player has started his or her opponent's timer, the opponent may "Hold!" or challenge. As above, once the player has drawn at least one tile from the pool, the opponent may not challenge or hold anymore. Using clocks: Once an opponent has called "Hold!" at the proper time, s/he has as long as s/he wants to think about challenging, as long as s/he hasn't yet made the next play. The player can insist on drawing tiles after one minute, as long as s/he keeps the replacement tiles separate from the old tiles. This is called the "Courtesy Rule". If there is a successful challenge, the opponent may see the replacement tiles before the player returns them to the pool. Using sand timers: After calling "Hold!" the opponent has only the length of his or her turn - three minutes - to decide whether to challenge or not. The Courtesy Rule is in effect here as well. The boxed rules mention that the game is over when a player uses all of his or her tiles and there are no more tiles to draw. That player then earns the points still remaining in all the other players' racks, while the others subtract from their point total the sum of the points still on their rack. Whenever there is a challenge, regardless of how many words are acceptable or not, someone loses exactly one turn. If all the words formed on the play are acceptable, then the challenger loses his/her next turn. 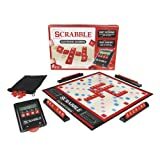 If at least one of the words formed on the play is unacceptable, then the whole play is considered unacceptable, and the player must remove all the letters from the board played that turn and scores zero. This is known as playing a "Triple-Triple". To compute the total score for the play first add up the values of the individual tiles, counting the Double Letter Score bonus if it's applicable. Then multiply by NINE. If all seven tiles of the player's rack have been used for this play, then add an extra 50 pt. Example: For the play of CRAZIEST, where the C and T are placed on Triple Word Score squares, with the Z falling on the Double Letter Score, using no blanks, the score is 3 + 1 + 1 + (10 x 2) + 1 + 1 + 1 + 1 = 29 X 9 = 261 pt. + 50 pt. = 311 pt. Actually, this play is the current single highest-scoring acceptable play in NSA Club or Tournament history. It was played in 1996 at a club in Michigan. The bonus is only scored for the player who originally covers the bonus square, and only for the one turn. Subsequent turns that use a letter already covering a bonus square don't score the bonus points. For example, suppose FAZE is placed with the Z on the Double Word Score square and scores a total of 32 pt. If someone later adds an S to form FAZES, the Double Word Score is NOT counted. My wife scores 400-450 points per game. Would she be considered an expert? Not necessarily. At clubs and tournaments experts average between 330-450 points per game. However, the competition is probably much stiffer than your wife encounters, and she may have to adjust her thinking to adapt to the typical 25 minute time limit per person per game when using a chess clock. A better measure of skill is determining the "average points per turn" score. If your wife averages 30 or more points per turn, not counting tile exchanges, then she may very well be an expert. The very top players average 35 or more points per turn, not counting exchanges. We suggest she visit and play at a club or tournament and see how she fares. Everyone who plays in an NSA sanctioned tournament earns a rating. Anyone with a rating above 1600 is considered an expert. The NSA recognizes over 500 experts.